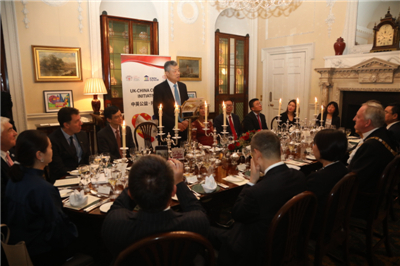 It is a real delight to join you at the launch dinner of the China-UK Charity Initiative co-hosted by the City of London and China Chamber of Commerce in the UK (CCCUK). Let me begin by expressing my warm congratulations on the launch of the Initiative. I would like to pay sincere tribute to the CCCUK and the Lord Mayor's Appeal Charity. I have great admiration for The Lord Mayor's Appeal, which is aimed at building "a better City for all". And I am proud that the China-UK Charity Initiative will be an important part of the Appeal. I hope and believe that, in the spirit and with concrete actions of building a better city for all, this Initiative will help build three "bridges" between China and the UK. First, I hope it will build a bridge of love to promote charities. Britain has a long tradition of philanthropy. It is the birthplace of the world's first law on charities, the Charitable Uses Act of 1601. In China, people believe in "seeking happiness in good deeds." In the words of the sages, "He is a man of virtue who offers financial help to many," and "To establish oneself, one should help others establish themselves." With the promulgation of the Charity Law of the People's Republic of China and the introduction of relevant policies in recent years, charities have thrived in China. In 2017, donations of all kinds topped $10 billion. I am happy and touched that the fund raised by the China-UK Charity Initiative will be donated to both British and Chinese charities. 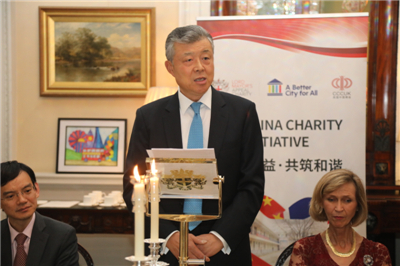 I believe that with the joint efforts of the City of London and the CCCUK, China-UK cooperation on public welfare and charities will be enhanced and will greatly facilitate the development of charity work in both countries. Second, I hope the Initiative will build a bridge of responsibility for upgrading China-UK cooperation. Businesses are basic economic units as well as main entities shouldering social responsibilities. Thriving China-UK trade and economic cooperation in recent years has brought tangible benefits to the people of our two countries. As of today, there are more than 500 Chinese companies in the UK. Together with the CCCUK, they have not only contributed to the local economy but also fulfilled their corporate responsibilities. In 2017, Chinese companies in the UK paid $260 million in tax and created more than ten thousand jobs. China Taiping Insurance sponsored London Symphony Orchestra's tour in China in recent years. The Bank of China has taken part in the City Giving Day for three years in a run. Huawei has been an important Patron of the Prince's Trust since 2007. Tonight, with the launch of the China-UK Charity Initiative, Chinese businesses in the UK are making yet another significant effort to fulfill their corporate responsibilities and serve the people of our two countries. This Initiative will help strengthen the ties between Chinese companies in the UK and the City of London. It will also boost China-UK trade and economic cooperation. Third, I hope the Initiative will build a bridge to the bright future of open cooperation. Charity work is not just about providing aid. It is more about connecting hearts. It is not just about "handing out fish". It is more importantly about "teaching people how to fish". I sincerely hope that the China-UK Charity Initiative will not only provide donations but also advocate openness, inclusiveness and win-win cooperation. This is the only road leading to development and prosperity in the world. This is also the irreversible trend of the times. This year marks the 40th anniversary of China's reform and opening up. China is committed to promoting a new round of high-level opening up on all fronts. The first-ever China International Import Expo last month displayed China's sincerity and resolve to open up its market further and promote open development around the globe. Here in the UK, thanks to open cooperation, the City of London has drawn the biggest and most influential financial companies from around the world. Both China and the UK are participants, beneficiaries and facilitators of open global cooperation. In face of surging anti-globalisation and looming protectionism and unilateralism, our two countries must join hands to advocate open cooperation. Together we can continue to contribute to a brighter future of open world economy. Two days ago, President Xi Jinping and President Trump had a successful meeting during the G20 Summit. They reached consensus on not imposing new additional tariffs. They also agreed to instruct the economic teams of the two sides to step up negotiations toward the removal of all additional tariffs and a concrete agreement leading to win-win results. This is a positive signal. Sound China-U.S. relations serve the fundamental interests of the Chinese and American people. They also contribute to world peace and prosperity, and meet the general expectation of the international community. "A benevolent person loves others from his heart; and this love will in turn boost his own cause". I would like to give my best wishes to the China-UK Charity Initiative. I wish you success, and I hope that you will spread love, light up hope and contribute to the China-UK "Golden Era"!